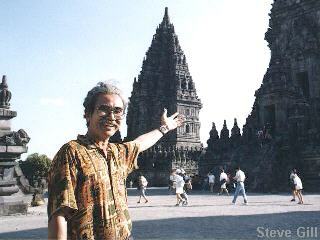 Pak Joedarto: "Welcome to Candi Prambanan!" Pak and Bu Joedarto insisted I stay for a week. . . How could I refuse? Among other things, we talked about Nengah. . . I was unable to get her out of my head, and Bu and Pak Yud were insisting that Balinese women made excellent wives. We did go to the Prambanan Temple complex, and to Yogya, a family gathering in Solo, sightseeing around Klaten, and Pak Andreas, an English teacher at a local high school invited me to his school where I spoke to six classes of happy, shy students. Later at Andreas' home (right out in the rural backblocks of Klaten) I had tea and cakes, dinner, and lots of interesting conversation with Andreas who is doing all he can for his students despite limited resources.